Wednesday's storm hammered New Jersey, where state police responded to more than 500 crashes. Brian Thompson reports from Manchester. The tri-state area, for the fourth time this month, is digging out after the fourth nor'easter in less than three weeks clobbered the region for more than 24 hours, lashing parts of Long Island with incredible snowfall rates of 4 to 5 inches per hour and decimating travel along the East Coast. The so-called four’easter, which has been blamed for dozens of wrecks and at least four deaths across the tri-state, prompted the governors of both New York and New Jersey to declare states of emergency. Winter storm warnings and advisories that went into effect late Tuesday expired by Thursday morning. More than 165 school districts announced delays and closures Thursday, but Mayor de Blasio's office said New York City schools would be open. Alternate side parking, though, is suspended again. Meanwhile, the region's three major airports were virtually shut down by the storm Wednesday, grounding thousands of flights as the snow swirled. JFK, LaGuardia and Newark Liberty international airports have all said Thursday will be a "recovery day," as only about 400 flights have been canceled. NJ Transit and Metro-North both announced they planned to operate regular weekday service on Thursday after modifying schedules to cope with the storm a day earlier. Amtrak, however, will continue running on a modified schedule. The flakes, for most of the tri-state, stopped falling early Thursday, except for a few lingering bands over eastern Long Island. 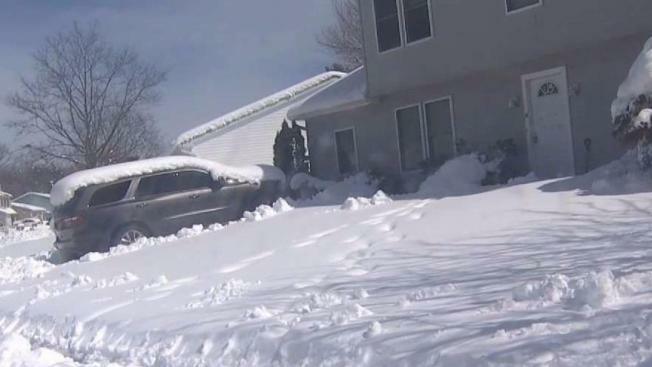 Patchogue on Long Island had seen the most snow fall in New York state with just over 20 inches. Queens Village saw the most snow in New York City, with 14.5 inches recorded as of Thursday morning. In New Jersey, Roselle recorded 11.8 inches. Check the latest snow totals in your neighborhood here. Storm Team 4 says the weather stays clear but breezy Thursday. Temperatures will stay below average this week. The system was the fourth nor'easter to wallop the tri-state this month. The first three ravaged parts of the region, knocking out power to hundreds of thousands of people, crippling East Coast travel and had been blamed for several fatalities. According to the National Weather Service, the last time the northeast saw four nor'easters in less than a month was about 30 years ago -- between the evening of Dec. 30, 1986 and Jan. 26, 1987.